PDF files can contain metadata, which provides additional information such as its title, author, subject and keywords. This can be used to possible copyright restrictions, adding keywords, which are not part of the document content, add catalog and author information to simplify document search or insertion into content management system. 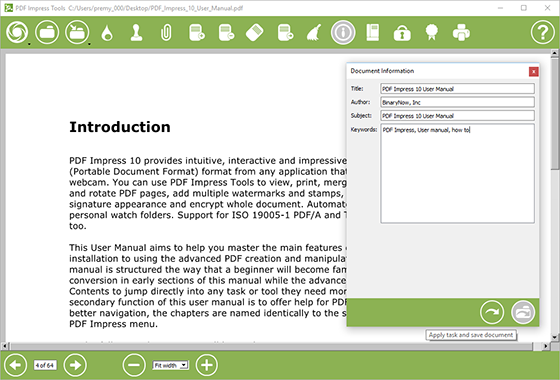 PDF Impress allows adding PDF metadata during the conversion process by adding Document Information task or editing already created PDF file in PDF tools. Batch process metadata is supported through Watcher, Workroom or through Convert to PDF folder in PDF Impress. Launch the PDF Impress Tool application. Click on Load document icon and browse to the PDF document. Click on Document Information icon. Fill up information in Title, Author, Subject and Keywords fields*. Click Apply task and save document. PDF document information is metadata that can be used to effectively search and organize PDF documents. Search engines commonly use metadata to effectively index a document. Title: Enter the title of this document. Author: Enter the author’s name. Subject: Enter the subject this document is about. Keywords: Enter the keywords for this document. Learn more and download trial of PDF Impress 10 here.